Ontario Bakery: It’s Apple Season! Here are 3 Sweet Dessert Ideas That Will Blow Your Mind! It’s Apple Season! Here are 3 Sweet Dessert Ideas That Will Blow Your Mind! Apple season marks fall in full swing. We all love the apple pies of late summer and early Autumn, but the truth is, there’s so much more to be done with the simple fruit and we don’t want you left in the dark! 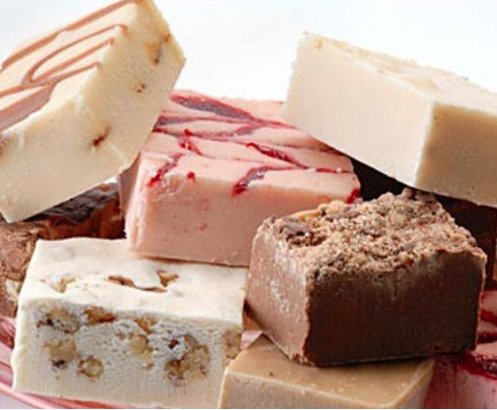 At Ontario Bakery, we specialize in custom baked and personalized cakes, cookies and more. From weddings to birthdays and everything in between, we know what tickles people’s taste buds. So if you are looking for more creative ways to enjoy the time tested apple, look no more. I love this one. Simply slice apples and toss in a bowl with cinnamon. Set out on a cookie sheet to bake until warmed. Serve into dishes and drizzle with caramel sauce, then sprinkle with powdered sugar. Feel free to make your own caramel sauce or buy. It’s all in the combining and presentation! Chop about 4 apples up in small pieces and just like above, toss with cinnamon and set out on a cookie sheet to bake and warm. Put about 1 - 2 cups of rolled oats in a large bowl. Drizzle maple syrup and a little honey on the oats, sprinkle cinnamon and nutmeg on top and then toss and mix. Place them evenly on a separate cookie sheet and broil on high for about 10 minutes. In a saucepan, place 2 TBSP of butter and ½ cup of cream cheese. Melt and mix together. Once all ingredients are ready, layer oats, then apples, then sauce and repeat. It’s like an apple cobbler parfait! 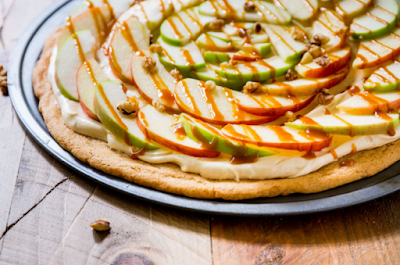 Saving a great one for last, is the apple pizza. First, prepare the dough for pizza as you would a regular pizza but par-bake it. (Bake it for ½ the time and then take it out.) For this next step, you’ll need a nog of some sort. (egg nog/rice nog/soy nog). Then, very thinly slice apples (even add pear if you’d like) and set to the side in a baking dish. Drizzle the nog over the sliced apples but don’t drown them. Use just enough to lightly marinate. Take your par-baked dough and spread a thin layer or olive or coconut oil on the pizza dough. Sprinkle cinnamon evenly on the oil. Then strain the nog from the pan and place the moist apples on the pizza. Put the pizza back in the oven to finish baking. For an added kick, add caramel on top and even make the butter/cream cheese sauce from above and drizzle on top of the pizza when serving! We love making your holidays sweeter and we know these recipes are going to be a win! 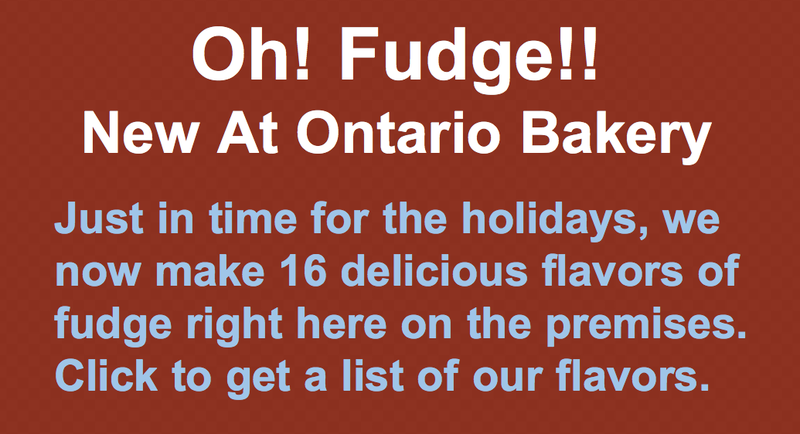 Just remember that for any of your custom baked needs and stress free holidays, Ontario Bakery is here to help you get the job done! 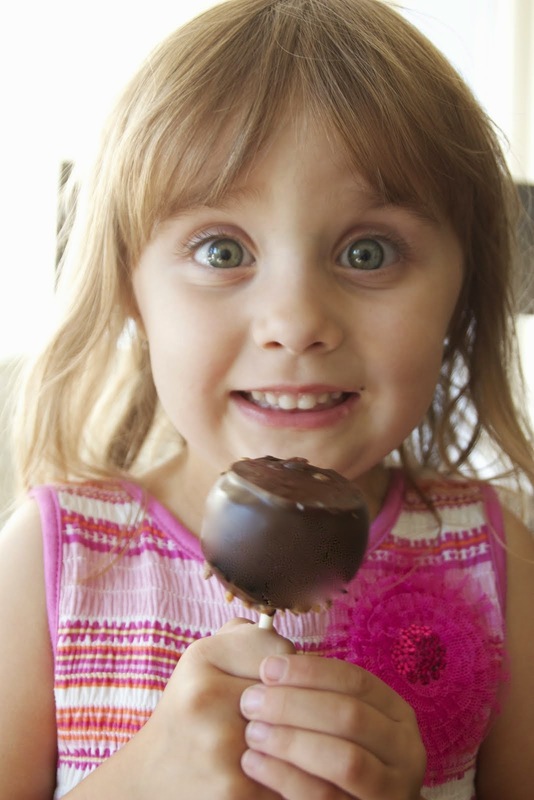 Contact us today to see how we can make your holidays sweeter!